Mobile internet provider 3 are cutting prices ahead of Christmas by reducing the up-front costs of their mobile internet devices. The MiFi Wireless Modem: previously £69.99, is now £49.99 upfront when you buy it on the ‘Broadband 5GB 1 Month’ deal. The package includes 5GB of data for £15 a month. The MiFi modem receives internet connection from 3 then broadcasts it out so you can use it to connect up laptops or any other wifi-ennabled devices in your house. There are other deals on pay as you go and the 3gb data contract as well. 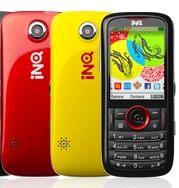 3’s Inq phone: the INQ Mini 3G, is now £49.99, down from £59.99. The internet-enabled phone now includes Twitter as a native application as well. wow… got great deals.. thanks for the info..